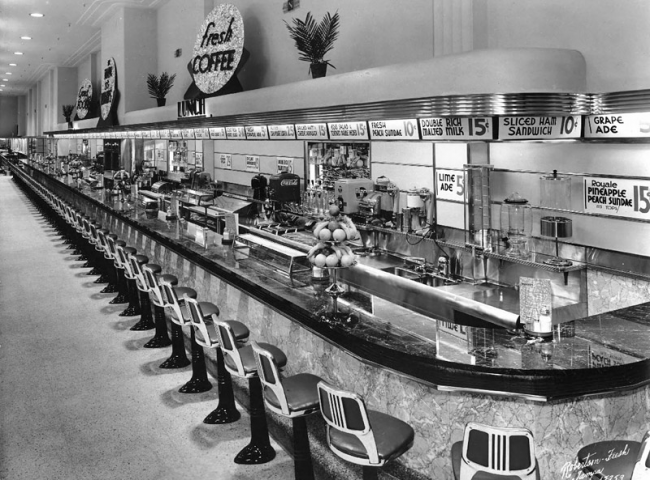 I remember here in SoCal seeing many lunch counters. Too bad they don't have them anymore. My older sister's first job was at the lunch counter at Woolworths. This was back in the mid-1960s. That particular Woolworth's was located in the local suburban shopping mall (which no longer exists - it was torn down several years ago and is now a Walmart). My first job was in the same mall at a department store. I worked in what we called the restaurant department, which included a full sit-down restaurant, an employee cafeteria, a sit-down snack/sandwich bar (all within the department store itself and served by the same kitchen) as well as another snack bar located out in the common area of the mall. I worked there all through high school. By the end I could do any job in the department, from hostess to waitress to cook to snack bar and even dishwasher. I enjoyed the variety, which is why I stayed for four years - back then it was kind of unusual to stay at a first job for that long. IIRC, they have the original lunch counter displayed at the Smithsonian in tribute to blacks getting equal access to those lunch counters. @dhultmanjr: So very true. I have seen programs on TV where couples & some singles actually Dress/wear makeup & hair from that era/classic cars/household furnishings ALL from the 50's/60's...Kinda kewl to watch...Wish I could find it on TV again.. I agree . . .Those days of a simpler time were soooooooo much more fun . . .
KEWL! My little hometown had a smaller version at the back of our local Rexall Drugstore...Shake machine, grill & all. Those were the days my friends. We thought they'd never end.....Bring them backkkk PLZZZZZZZZZZZZ..